This week has been a whirlwind…and it’s not over yet…. 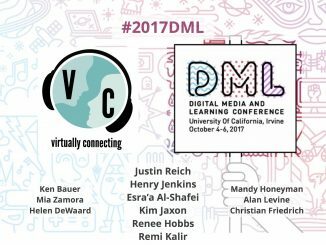 It was a thrill to “Virtually Connect” with the DML conference last week. A great big thanks to Henry Jenkins and Kim Jaxon and ALL of the participants for taking the time to “meet” with us. And to our professors for continually providing us with these unique opportunities. Much appreciated! I wish I hadn’t been so nervous and that maybe I had spoken up a little more, but I was still able to take away a great deal from the sessions. Saturday was my big meeting with the Kean Librarian. I was always curious what went on during the weekends at Kean. Well, to my surprise, there were multiple homecoming events, so parking was at a premium and the campus was buzzing. I had expected a ghost town. A very nice woman by the name of Janette Gonzalez was my guide for the day. I came to the meeting armed with tons of articles I had already found but was unable to fully “access.” She showed me how to navigate the Kean online database(s). Unfortunately, I didn’t know (and couldn’t figure out) my kean email password which was necessary for downloading my resources, etc. (It’s a weird story, but basically I’ve been automatically logged-in to my email for two years with – what I am assuming- was a temporary and random password that I had not changed or made up myself- therefore, I could not remember it.) So, I have been anxious to get to work, but needed to wait until today (Monday) to have my password reset. Overall, definitely a worthwhile trip- even if only to figure out how to get unlimited access to the periodicals, books, etc. I’m a pretty good keyword searcher and, although good intentioned, I don’t think Janette was going to uncover anything I couldn’t. It was, though, good practice in explaining my research in simple terms. Today, after about a minute-long phone conversation with a Kean computer-staffer, I was in business. Password reset. Up until this point, aside from a few articles and some published theses, etc., much of my “research” has been reading the abstracts and/or released excerpts of books/journal articles. Believe me when I say that it has been more than enough to keep me busy! However, I am now at a point where I feel ready to “dive deeper” into some of the resources I’ve curated. It has been an important narrowing-down process. I am getting a better sense of where my work might “fit in” and about how what I want to do might add to the conversation. That feels amazing to say. Before I chose my topic, I was mildly interested in what it means to compose in different modes. Now that I am certain I want to revolve my work around my experiences pertaining to 9-11 and the loss of my father, I am sure this cannot take a back seat. It cannot be something “in the background” of my research. It’s like the elephant in the room. I do, at last, feel like I have something significant/meaningful to say. This is a good thing. There’s this feeling that you get when you come across a search result that relates to your work so perfectly…it’s almost indescribable. When that happens, you just know you’re on the right track. Sometimes it makes me think of something from a new angle or realize something I hadn’t considered. After all, how can i know what I want to say if I don’t know what others have already said. When fiction writers depart from official, politically motivated accounts of history or take representational liberties with it, they typically have the most impact. The devastating trench poetry of World War I and novels such as All Quiet on the Western Front and Death of a Hero opened the twentieth century; Tim O’Brien’s The Things They Carried, published fifteen years after the fall of Saigon, closed it. All are narratives of cultural and psychological breakdown, miring their readers in an unredeemingly appalling landscape. Thus far, no 9/11 novel has approached the profound historical and psychological insights of these works or the formal innovation (e.g., O’Brien’s merging of memoir, history, and fiction) that may very well be what such a book must achieve, given the metafictional moment in which we live: a moment in which action movies and thriller novels are invoked more often than historical analogies; in which psychologists contended with the phenomenon of trauma by proxy as people who had watched the events on television across the country and around the world complained of PTSD symptoms similar to those people who’d been near Ground Zero; in which a few callous voices described the attacks on the World Trade Center as artistic acts of terrible beauty. Writers are treating 9/11 in increasingly imaginative ways; however, this is where time does matter. The historical moment is not yet “over,” temporally or psychologically. The international consequences of that day continue to unfold, migrate, deepen, and shift. Just this year, JAMA published a study showing that the rate of PTSD among people living in lower Manhattan during the events of 9/11 was increasing, not decreasing. The ground is still settling, and with it, our narratives. Contemporary literature seems to have reconciled the idea that everything valuable has already been said and done and, as such, has wilfully inscribed itself in a never-ending cycle of narratives about narratives, in a process of recycling and updating the past, which some love to name postmodernist. What is left at stake is simply the consumerist need to produce an oxymoronic ‘original copy’: to launch that piece of literature unseen and unheard of before on a crowded book market. A recipe for success seems to be the ability to combine the novelty of the architectural design – the formal innovation – with the thematisation of the present. 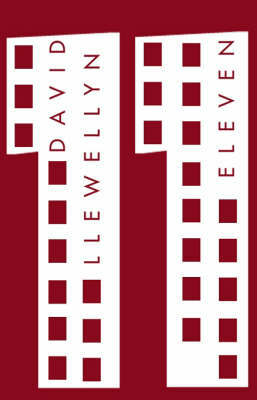 It is precisely what the young Welsh novelist and scriptwriter, David Llewellyn, achieves with his debut novel, Eleven. In an attempt to translate the old into the new, Eleven is constructed following the design of the early modern epistolary novels, yet making use of a contemporary mode of writing: the email. Thematically, it is an exploration of patterns of individual thinking shaped by the media, against the background of an event with global consequences, which is, nevertheless, viewed from afar, without the inherent trauma so visible in American post-9/11 fiction. The present paper aims at analysing the construction of the novel, including the linguistic transformations it employs, and at accounting for the identitary revolt that transpires from the e-mails exchanged between various character-narrators on an apparently ordinary day: September 11, 2001. Lots for me to think about and read!! !